See our home page for sale price on all hardbacks – as much as 83 % discount and most at least 50% off plus no sales tax! This beats Amazon hands down! 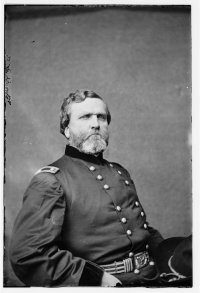 By the fall 1861, Jeb Stuart was frustrated that his father-in-law, Philip St. George Cooke, had remained in the U.S. Army instead of joining with his native Virginia and the Confederate army. Stuart’s one-year-old son had been named after Cooke, but in frustration both he and his wife, Flora, changed the boy’s name from Philip St. George Cooke Stuart to James Ewell Brown Stuart Jr. To reflect the war’s split on the family: Cooke’s son [James Rogers Cooke] sided with Virginia and so did two of Cooke’s daughters and husbands. Cooke’s other daughter and husband stayed with the Union. To ease his wife’s distress over the family’s Civil War estrangement, Jeb Stuart wrote the following to Flora. 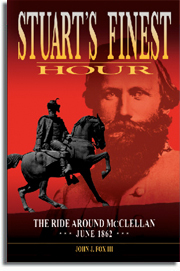 FEBRUARY 2017 SPECIAL – BUY copy of Stuart’s Finest Hour at discount of $27.95 and receive FREE a Jeb Stuart bookmark and a FREE copy of Southerners at Rest: Confederate Dead at Hollywood Cemetery where General Stuart is buried! 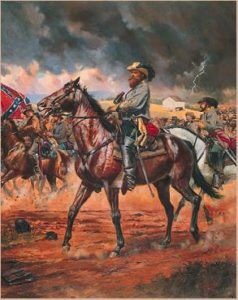 Lieutenant Colonel Jeb Stuart wrote to his wife, Flora, in June 1861 that he and his cavalry were operating near Winchester, Virginia protecting Confederate troops commanded by General Joseph E. Johnston. The big question of the time for Southern men was – Do you support and bear arms for your state against the Union? Do you support secession? The excerpt below reflects what Stuart thought and also shows why reading the words of participants in a historical event gives proper perspective. 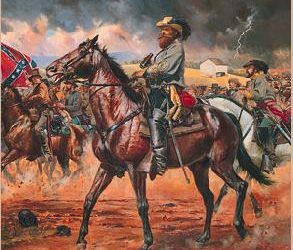 We will continue to honor the memory of Confederate cavalry General Jeb Stuart by printing anecdotes and excerpts from his letters during February. 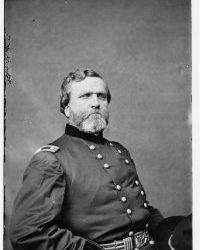 When Stuart resigned his U.S. Army commission on May 3, 1861 to join Virginia forces he hoped that his father-in-law, Colonel Philip St. George Cooke, would do the same. 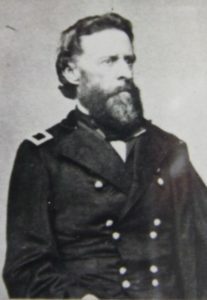 Cooke was a native of Leesburg, Virginia and had been an officer in the U.S. Army since he graduated from West Point in 1827. Cooke was considered the army’s expert on cavalry tactics. The below excerpts from two letters Stuart wrote to his wife Flora reflect his position. “How I hope your Pa will resign. If he could only see things in their true and real light – which it is difficult to do so far off – he would resign instanter. He is wanted here very much. He is highly complimented everywhere and would soon take a foremost stand in the State defense. Why doesn’t he come? “I am extremely anxious about your Pa and John R. Cooke [son]. I do hope both will resign at once. How can they serve Lincoln’s diabolical government? Your Pa would be made a Brigadier General and he would be on the same side with his children if he would resign. Principle, interest and affection demand his immediate resignation and return to his native State. 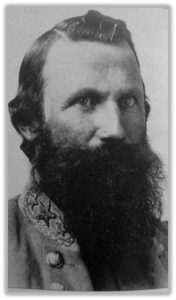 Yesterday [Monday, February 6] was General Jeb Stuart’s 184th birthday. May the image of the Bold Cavalier live on in the minds of military tacticians worldwide! Below painting by John Paul Strain “The Bold Cavalier”. All month we will continue to carry anecdotes and excerpts from letters written by the general. 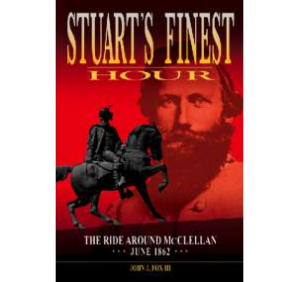 To honor General Stuart’s birth month, we continue to show pertinent letters in his words. This brief letter written by then Lt. Jeb Stuart resigning his commission in the U.S. Army so he can travel back to Virginia and join Virginia forces since the Virginia Convention voted to secede on April 17, 1861. 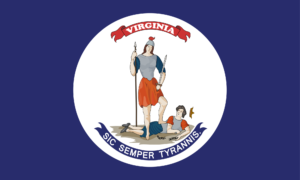 From a sense of duty to my native State Virginia, I hereby resign my position as an officer in the Army of the United States. 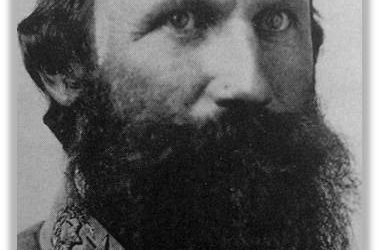 In continued celebration of Major General Jeb Stuart’s birth month, below is an excerpt from a letter written by then Lieutenant Jeb Stuart [U.S. Army] to his older brother back in Virginia as the young cavalryman decided where his allegiance belonged. 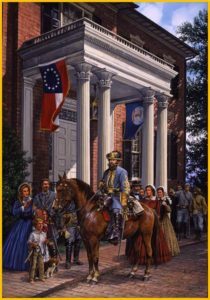 Below is an excerpt from a letter written by then Lieutenant Jeb Stuart [U.S. Army] as he wrestled with the fateful decision whether to remain in the U.S. Army or resign and side with his home state of Virginia. 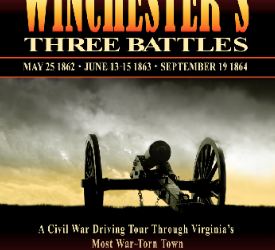 Retired Shenandoah University History Professor Dr. Brandon H. Beck will be signing copies of his 11th book this Saturday, September 24 at Winchester’s Old Court House Civil War Museum from 4 -6 pm and then a reception will follow at 6 pm. 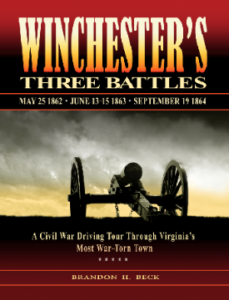 The book, “Winchester’s Three Battles: A Civil War Driving Tour Through Virginia’s Most War-Torn Town,” will guide the reader over the Hallowed Ground of the First Battle of Winchester; the Second Battle of Winchester; and the Third Battle of Winchester. 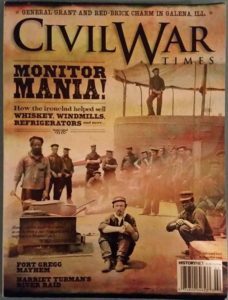 Driving directions, maps, images and a battle narrative will guide locals and visitors alike through this town that changed hands between the two armies at least 72 times during the Civil War. All are welcome!